Featured amenities include a computer station, express check-out, and multilingual staff. Free self parking is available onsite. When you stay at Holiday Inn Express Hotel & Suites Clearwater North-Dunedin in Dunedin, you'll be near the beach, within a 15-minute drive of Coachman Park and Bright House Field. 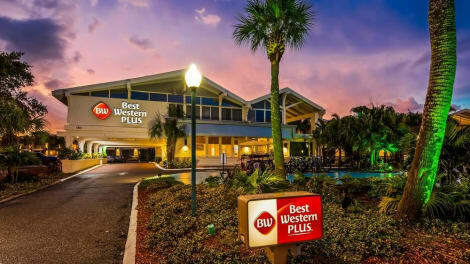 This hotel is 5.8 mi (9.4 km) from Clearwater Marine Aquarium and 6.2 mi (9.9 km) from Pier 60 Park. lastminute.com has a fantastic range of hotels in Dunedin, with everything from cheap hotels to luxurious five star accommodation available. We like to live up to our last minute name so remember you can book any one of our excellent Dunedin hotels up until midnight and stay the same night.